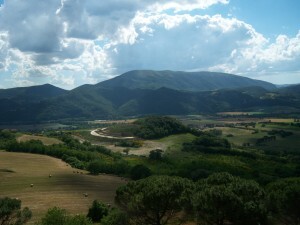 Umbria is a very beautiful province adjacent to Tuscany. Its hilltop towns rival any in Italy. 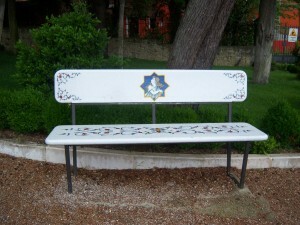 My favorite is Perugia. You can walk the perimeter of the old city and view the vast green and terra cotta vistas. Having previously toured Perugia, we stopped only for lunch on our way to Deruta. Luckily there were several small shops open and we were able to see artisans at work and well as a large sampling of their crafts. Due to the fact that this is not “made in China” kind of pottery, prices were somewhat steep but quite lovely. Many of the places offered to ship pieces to the U.S. for very moderate fees. On our way back, we observed what seemed to be a small, old hilltop town. Wondering what it might hold, we wound our way up to the top, only to discover what would be the equivalent of a subdivision. No shops, no pizza parlors, just a neighborhood of quaint homes, two cats, and an elderly lady who was convinced that if she repeated herself enough we would eventually understand her Italian. 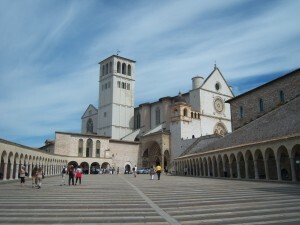 Our next trip to Umbria was to Assisi, an old town that honors the patron saint of Italy, St. Francis of Assisi. In his honor there is a large Basilica that contains many pieces of Renaissance Art. We decided to buy a guidebook and tour the holy place in that way. Despite several tour groups headed by monks of different backgrounds and languages, the pilgrims were respectful. There were no loud voices or people sneaking photographs. I mention this because every time I have visited the Sistine Chapel, I have been disappointed by the regular admonishment from the guards for “Silence,” and the Americans who think that rules don’t apply to them and use their children as photographers, as they block the path of chapel personnel. All this takes away from the spirit of the place. We left the Basilica to wander the streets. If there is a modern part of Assisi, I never saw it. The entire town still holds the architecture of the 1400’s. There are numerous shops and with a little bit of know how, you can find authentic arts and crafts amidst the tourist plastic. We passed a pastry shop with what appeared to large mounds of a chocolate mousse type cake. When presented with a slice of it, the cake turned out to be fudge, quite good but very rich, surprising to me as the Italians prefer more subtle sweets. We finished our day with a visit to a second Basilica that honors the lesser-known Saint Clare. Hers is a more simple dwelling but also displays numerous Renaissance frescos and paintings.